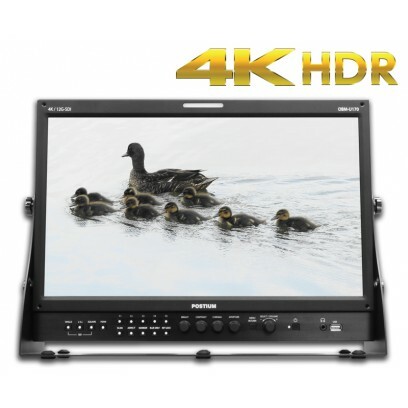 The most feature-rich line of 4K production monitors by Postium. It boasts colour accuracy and panel uniformity that are essential for colour critical applications. The OBM series offers full 4K support up to 4096x2160 at 60p signals and features 12G-SDI single link and HDMI 2.0 inputs. In addition to multiple input support, the monitors support side-by-side colour space and gamma comparison as well as full 3D-LUT support. With the OBM series of monitors, Postium have prioritised quality and compatibility to offer the most complete and versatile 4K monitors. The OBM U series is equipped with standard 12G-SDI input interface(x2) , 3G/HD-SDI input interface(x2) and support 4K Quad Link 2-Sample Interleave signals and 4K Quad Link Square Division signals. The OBM U series can accept up to 3840x2160/24,25,30,50,60p and 4096x2160/24.25.30,50,60p signals. This function minimises the interlaced video processing time delay. This mode is also useful when displaying fast-motion interlaced video content and when reducing the delay between video and audio. he Black Stretch increases the visibility of subjects in dark areas, not degrading image quality in bright areas. This mode can be used to increase shadow detail without changing the absolute black level, and without affecting mid-tones. This unique function allows users to compare the two different colour spaces, gammas, HDR / SDR, camera logs and any other colour settings side by side simultaneously. The comparison area can be moved and selected by using the vertical wipe pattern. These features enable users to monitor sources using the internal Waveform and Vector Scope. Waveform Wide mode* is supported, and both Waveform and Vector Scope can be displayed simultaneously. Gamma value is adjustable from 1.0 to 3.0 as user's preference to monitor in the dark area of the picture. Any pictures taken in either light or dark environment can be easily watched or analysed. The wide colour gamut and the advanced 3D LUT function enable the OBM series to reproduce various colour spaces accurately and the excellent grayscale. You can select from colour gamuts such as DCI-P3, ITU-R BT.2020, ITU-R BT.709, SMPTE-C, EBU, Native. The OBM series can display closed captions with an SDI input. It supports the CEA-708(HD-SDI closed captioning standard) and CEA-608(SD-SDI closed captioning standard). The OBM series can display various markers, including aspect marker, area marker, and centre marker. In addition, the detailed display settings of each marker are allowed. For example, the colour, brightness, horizontal/vertical position, and thickness of aspect markers can all be adjusted. When multiple users share the same monitor, each user can register his/her own password for colour temperature and user preset data. This ensures the users correctly recall their preset data, and keep preset information safe from unauthorized use. The OBM series allow the user to import 3D Look-up Table for accurate and consistent colour matching between individual displays as well as using customized ‘looks’ that have been created by 3rd party colour-grading applications. 32ˆ³ and 64ˆ³ cube file are supported.